Innovative force and customer orientation are the values that determine daily production at mbk. mbk has now faced up to the latest market requirements and has conceived and realised the first fully automatic production line for the manufacture of box culvert reinforcements in accordance with individual customer ideas. 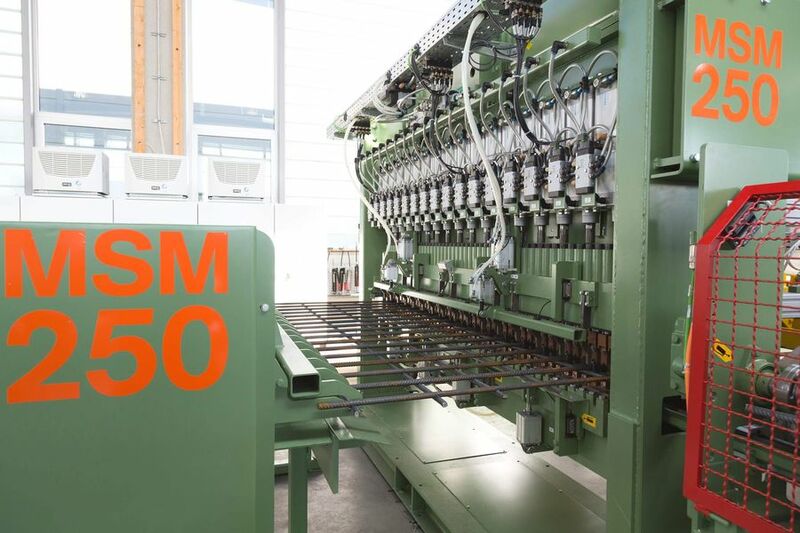 mbk Maschinenbau GmbH has two semi-automatic MSM-B mesh welding machines on the market – now a fully automatic machine has been realised and delivered at the customers’ request. Daily work thus focuses on the reduction of the use of personnel to a minimum, high process reliability, maximum quality and flexibility, an optimised workflow and eco-nomical aspects. Bent 3D meshes with wire diameters ranging from 8 to 20 mm can be manufactured with the MSM-B line. It is used for the manufacture of meshes for rectangular pipes (box culverts) in the precast industry. On account of its impressive features, this new development is also ideally suited for precast bridge segments and other strongly reinforced special and series precast elements. The MSM-250-B has a huge performance capability: It can produce meshes in widths of 1,000 mm to 2,500 mm (max. 4,000 mm) and lengths of 1,500 mm to 10,000 mm (max. 15,000 mm). The longitudinal reinforcement, pre-cut, is possible from 12 mm to 20 mm, smooth or ribbed. The longitudinal wires can be placed from a distance of 100 mm in a 50 mm grid pattern (100, 150, 200, 250 mm, etc.). The transverse reinforcement, which is also smooth or ribbed, is pre-cut in the range from 8 to 16 mm. The transverse wire grid pattern is variably programmable from 75 mm. 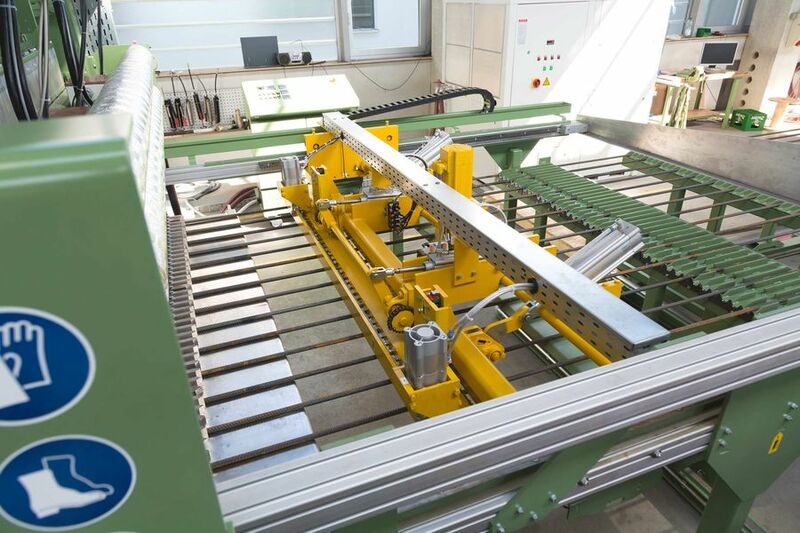 At the customer’s request other parameters are possible, as well as the supply of the longitudinal and transverse bars off the coil by means of the DRA straightening machine. The new production line from mbk Maschinenbau GmbH is optimised for the automatic production of bent 3D meshes. The MSM-B mesh welding machine, the mesh transport and tilting unit and the link to the MBM-V bending machine make up the complete unit. 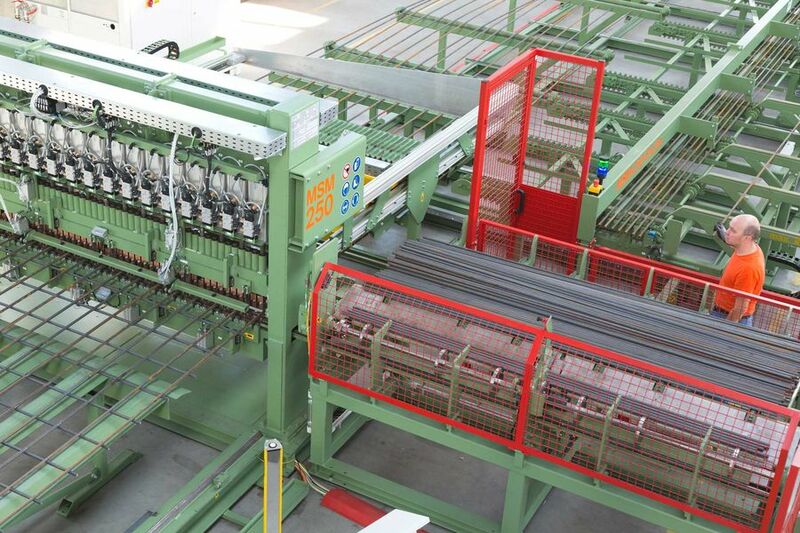 Its equipment consists of a semi-automatic longitudinal wire feeder, whose max. wire length and diameter are 15,000 mm and 20 mm respectively. Through combination with the mbk DRA wire straightening machine, coil material can also be processed and the machine can be further automated as a result. The manual separation of the longitudinal wires is provided for by a wire frame that can bear a max. bundle weight of 3 tonnes at a length of 15 m and from where the bars are transferred to an automatic chain magazine. The main welding unit is comprised of a stable frame and welding units which are fixed to it. The automatic feeding system for the transverse bars from the bundle (the desire for supply off the coil can be accommodated in this case, too) supports the smooth production procedure. Responsible for the uncomplicated mesh transport is a trolley car that transfers the meshes to the downstream tilting table. A Siemens terminal with touch screen is available for the visualised control. Remote maintenance of the machine via a LAN connection is possible. The securing of the machine by means of safety light barriers and safety fences in accordance with the Machinery Directive /CE is a matter of course. Beyond that the MSM-B line is even suitable for tropical climates up to 55 °C. The trolley car transports meshes up to a length of 15,000 mm and a width of 2,500 mm (max. 4,000 mm). The maximum lattice weight is 1,200 kg. 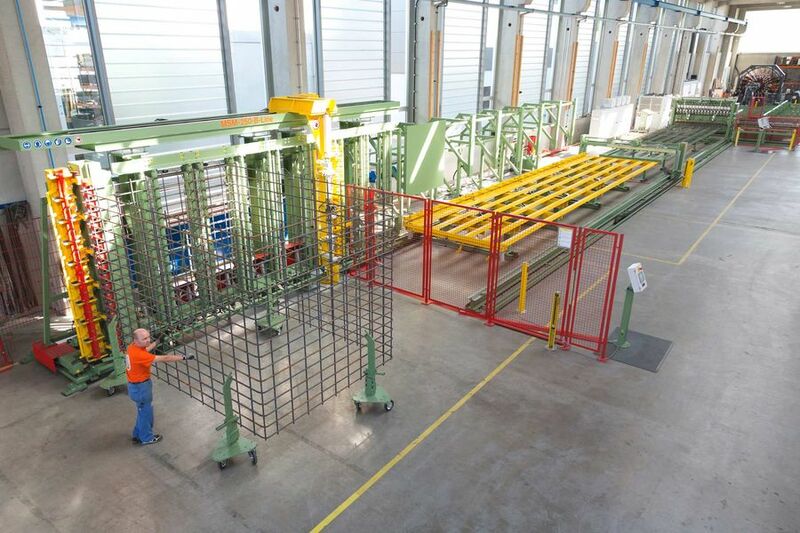 After the deposition of the meshes on the tilting table, the latter brings the meshes into the upright position for the downstream bending process while the trolley car returns to the main welding unit, where it is then immediately available for the production of the following mesh. A high-performance hydraulic unit guarantees that the tilting proce-dure is also an uncomplicated work step in the total production process. After being picked up by a further automatic trolley car, the meshes are fed to the MBM-250-V bending machine, whose task is to bend the meshes to form the desired end product. This special construction is designed for a working width of 2.5 m; however, individual dimensions according to customer requirements can also be realised. The fast setting of the bending cams makes highly flexible use possible. The MSM-B line noticeably simplifies the manufacture of reinforcing products. Whereas previously they had to be bent by hand and then laboriously bound together one by one, many work steps are now eliminated or noticeably facilitated by the use of pre-produced meshes. 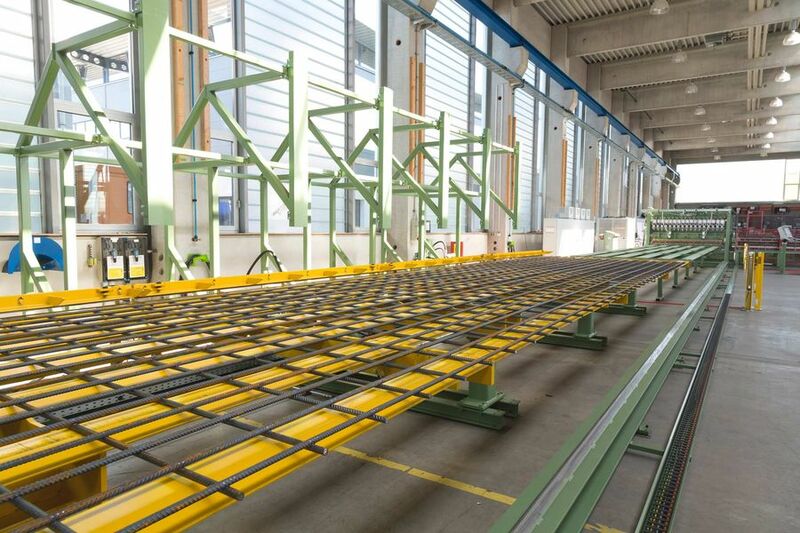 The lead times in reinforcement construction are also considerably reduced through this new manufacturing possibility – but with the same constant high quality, which is ensured by the proven and mature welding technology from mbk. 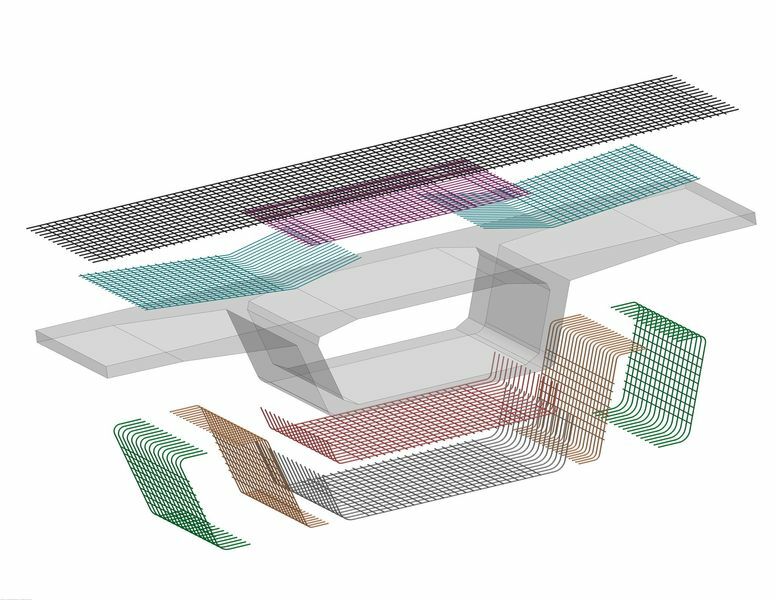 An enormous advantage lies, for example, in the assembly of the individual reinforcement groups (meshes): Through the systematic planning of the 3D meshes, every single work step in reinforcement construction is optimised. Individual elements such as overlaps and additional reinforcements can thus be calculated precisely in the statics and the actual reinforcement needs determined. 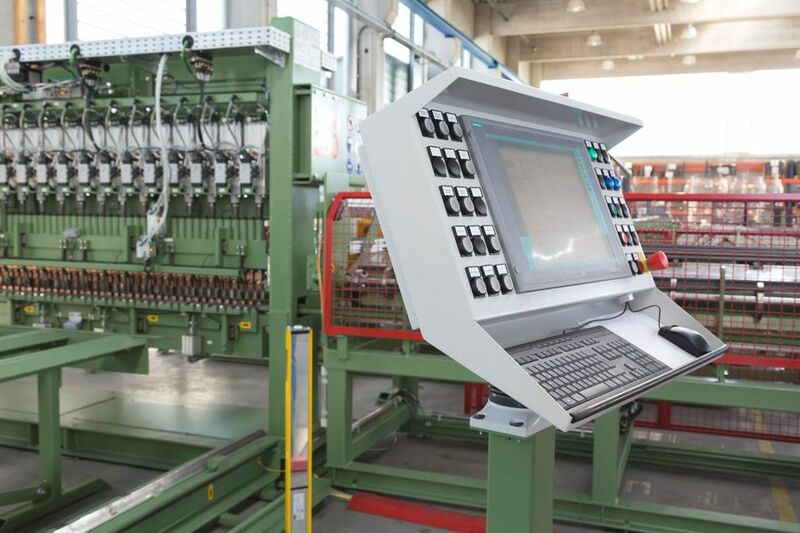 With the development of the automatic production line, mbk Maschinenbau GmbH has found a way of industrially manufacturing strong reinforcements up to 20 mm that previously had to be manufactured individually. The range of uses varies widely, extending from the flat, L, U, and Z meshes to the octagonal, fully-closed mesh. This means that the automatic production line could be of equal interest for both the construction of buildings and underground construction. The production of columns and joists reinforcements can be completely covered with it. In addition, it could make a very good addition for mesh producers when it comes to producing meshes above the standard diameter. The MSM-B line is an innovative development and mbk’s answer to the requirements of tomorrow’s constantly changing market.